This November, fall into traintastic adventures with Chuggington! 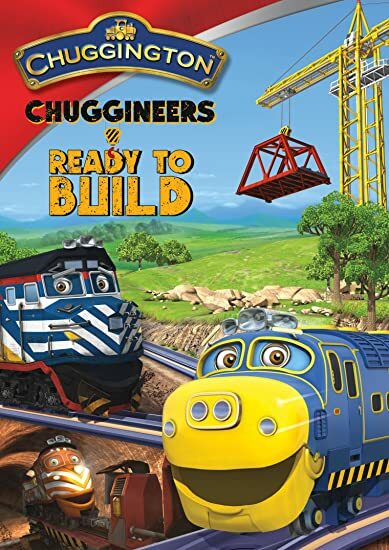 To celebrate the release of the new “Chuggineers Ready to Build” DVD (that just hit store shelves last month! ), we are also featuring the hottest new Chuggington playset that will be on every cool preschooler’s list for the holidays! All new to train play, this Chuggington set features a working escalator that takes your engines back to the top so you can send them speeding back down again and again. Or take Brewster for a ride on the elevator so he can get to the top to operate the giant crane and repair the broken track. There are so many ways to play. Who is the strongest and most dependable construction crew in Chuggington? The Chuggineers! In this special collection of hard-working adventures plus train loads of free bonus features! Brewster joins Chuggineers Zack, Fletch and Tyne to build tracks, bridges and tunnels, make repairs, haul heavy loads and more! Featuring new wagons and machines -- like the huge yellow Mega Chug Crane -- and new friends -- including Payce, the tunnel runner from Tootington, and Cormac, the cheeky forklift engine -- Wilson, Brewster, Koko, and your own little trainee will discover important lessons about safety, responsibility and teamwork!